One of my all time favorite Weight Watchers quinoa recipes is this super easy Quinoa Salad with Tahini Dressing — it’s to die for! Admittedly, I’m pleasantly surprised my kids really enjoyed this dish…my son even took leftovers for lunch! And it’s a really satisfying summer side dish that is lovely and absolutely delicious. If you are already a fan of quinoa or a newcomer looking for some fantastic quinoa recipe ideas, this dish is a great one to try! I love the variety of textures, and the lemony tahini dressing just pulls it all together so beautifully. I’ve also made this with the addition of cucumbers, roasted zucchini, cauliflower and eggplant too, and it is fabulous. Enjoy! 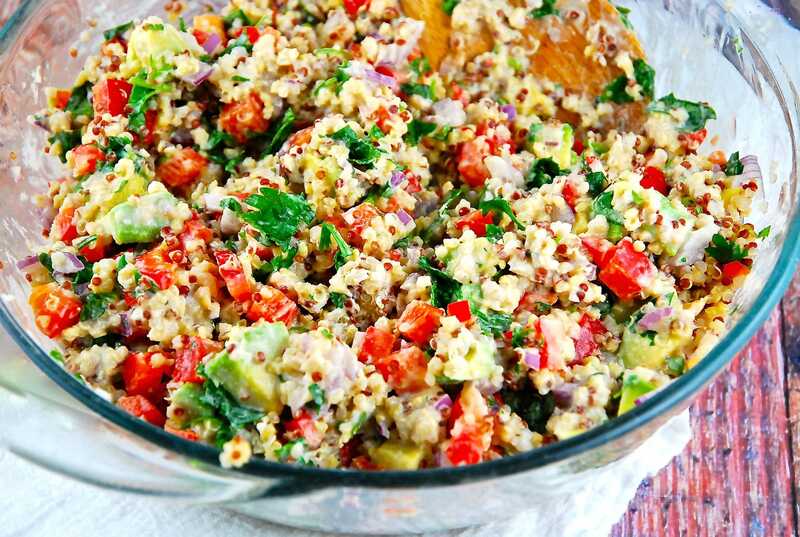 Healthy and delicious, this quinoa salad was a hit with my family. What a great way to add some vegetables and healthy grains to your diet without going overboard on Points! And the divine tahini dressing is the perfect way to bring all the wonderful flavors and textures of this salad together. Cook quinoa according package directions. Transfer to a medium sized bowl, an set aside. Make tahini dressing by whisking together the tahini paste, lemon juice, garlic and salt. Add water as needed to thin out the dressing to desired consistency. Add remaining ingredients to quinoa, and then stir in the tahini dressing. Toss well to combine. Season with salt and pepper as desired. Serve warm or chilled.